Northpoint Rosette Heavyweight Sherpa Blanket Just $29.99! Down From $120! Ships FREE! 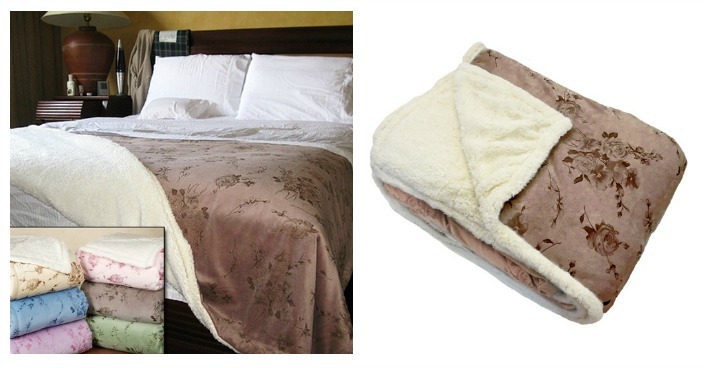 You are here: Home / Great Deals / Northpoint Rosette Heavyweight Sherpa Blanket Just $29.99! Down From $120! Ships FREE! GearXS has this Northpoint Rosette Heavyweight Sherpa Blanket on sale for $29.99 (Reg. $120) + FREE shipping! This elegant blanket is super soft and supple to get you through the coldest nights. One side features an elegant and refreshing floral embossed design that breathes, while the other side offers a micro sherpa material that instantly warms the body. This blanket is 100% polyester, and is machine washable. The refreshing floral design is like no other. Heavy weight and cozy, it is perfect for any room! Order today.